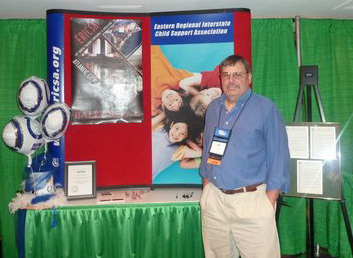 Our 50th annual Eastern Regional Interstate Child Support Association Training Conference and Exposition was held from May 19 through May 23rd, 2013, at the Hilton Orlando Lake Buena Vista in Orlando Florida - Where creative minds meet. The 49th annual Eastern Regional Interstate Child Support Association Training Conference and Exposition was held from April 1st through April 5th, 2012, at the downtown Hyatt Regency in beautiful Indianapolis, Indiana. ERICSA went GREEN in Lexington! Our new Commissioner, Vicky Turetsky has been invited to speak and give us the Federal outlook for Child Support. You will want to hear her plans for the program. Other sessions at our training conference will focus on the topics that are most important to you – the Child Support Professional. We will have the latest information to keep you up-to-date on child support issues. ERICSA’s 46th Annual Training Conference & Exposition (ERICSA ’09), which was held at the beautiful Marriott Grand Dunes Resort in Myrtle Beach, was an overwhelming success! The conference brought together over 400 child support professionals from 41 States and Territories, five Tribes and Australia! The conference opened with our President’s Reception followed by a lively game of Music Trivia. It was fun to see the competition among the professionals! ERICSA ’09 departed from the 'norm' for our opening ceremony with a special tribute to our beloved Gordon Moseley who passed away shortly after our 2008 ERICSA conference. Larry McKeown, SC IV-D Director opened our tribute to Gordon in a characteristically humorous, yet very emotional introduction. It was Gordon’s dream to host the ERICSA conference in South Carolina, so the conference was dedicated to him. The color guard for ERICSA ’09 was from the North Myrtle Beach High School ROTC. We enjoyed a fabulous choral performance by the Lakewood Elementary 5th Grade Chorus, which was directed by Dianne Hart. This included a great surprise of dramatic dancing by members of the chorus, which was met with enthusiastic applause and a standing ovation from the entire audience. Patterson Poulson, ERICSA President, spoke on behalf of ERICSA and provided an historical background of the Association, as well as honored the passing of a lifetime association member, Mike Keeler and Viola Canady, who created the ERICSA children’s quilt that is proudly displayed in the ERICSA booth. One of the highlights of the opening ceremony was the presentation of the Felix Infausto Award to Lee Sapienza from New York Child Support Enforcement. Lee has long supported ERICSA and has a true passion for the child support program. Dr. Kathleen Hayes, SC DSS Director and Julie Armstrong, Charleston County Clerk of Court welcomed all the attendees to South Carolina. They 'blessed our hearts'. The other opening speaker was Donna Bonar, Acting Commissioner of the Federal Office of Child Support Enforcement who welcomed ERICSA from the Federal perspective. Thank you for joining us in Myrtle Beach, SC. Check out the Conference photos on our Conference Page, in our photo gallery! 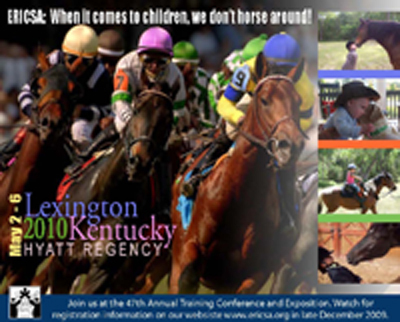 We look forward to seeing you in Lexington Kentucky. "Children: The Heart and Soul of ERICSA"
ERICSA’s 45th Annual Training Conference & Exposition held at the elegant Peabody Memphis Hotel in Memphis, Tennessee was a resounding success! The conference brought together over 350 child support professionals from 39 States and Canada. The conference opened with a color guard from the Memphis State University Army ROTC and an exuberant choral performance by the Saintly Singers from Briarcrest Christian Schools located in Memphis, followed by welcomes from Cyndy Lucas, ERICSA President, Mike Adams, the Tennessee IV-D Director, and Margot Bean, OCSE Commissioner. A highlight of the opening ceremony was the presentation of the Felix Infausto Award to Sara McCollum. The conference theme "Children: The Heart and Soul of ERICSA" was at the center of the various workshops and plenary sessions. Critical updates were presented on DRA and Federal Initiatives. Several interstate workshops covered UIFSA Fundamentals to International Child Support. Workshops provided innovative approaches to workplace training and workplace efficiencies. Attendees were provided up-to-date information on a wide variety of child support issues, including fatherhood, medical support, arrears management and paternity. More importantly, they made crucial interstate connections with their peers that will provide them avenues for improved communication in interstate case situations. Our motivational speaker, Dr. Jerry Teplitz, delivered a fun fun-filled, interactive session designed to help people change with confidence. The music trivia game held Sunday Night was a conference favorite and a provided a great ice-breaker to give attendees a chance to meet each other. What would an ERICSA conference be without its special events? The President’s Reception gave the President and Board of Directors the opportunity to meet and greet new and returning conference attendees. Evening activities included a night at the ball park watching local minor league baseball team Memphis Redbirds play the Albuquerque Isotopes and, of course, the closing banquet for the conference. The great location of the hotel made it possible for attendees to relax after an information-packed day of workshops by strolling down Beale Street, listening to the greatest Blues music in the world and partaking of world-renowned Memphis Barbeque. Thank you for joining us in Memphis, TN, and we look forward to seeing you in Myrtle Beach, SC March 26 - April 2, 2009. ERICSA’s 44th Annual Training Conference & Exposition held in historic downtown Norfolk, Virginia was a tremendous success. The conference brought together 375 child support professionals from 29 States and Ottawa, Ontario. The conference opened with a color guard from the U.S. Naval Base and an exuberant choral performance by the Saint Patrick Catholic School, followed by welcomes from Cyndy Lucas, ERICSA President, Nick Young, Virginia IVD Director, Margot Bean, OCSE Commissioner and the City of Norfolk. A highlight of the opening ceremony was the presentation of the Felix Infausto Award to Chrissy Brogdon Dingeldine. The conference theme “Navigating Changing Tides” charted the course for the variety of workshops and plenary sessions. Critical updates were presented on DRA and Federal Initiatives. Several interstate workshops covered UIFSA Fundamentals to International Child Support. Workshops provided innovative approaches to workplace training and workplace efficiencies. Jim Snack, motivational speaker and master magician, delivered a captivating blend of magic with his message “The Magic of Change”. The informal interstate networking workshop with child support colleagues from various states was a conference favorite. What would an ERICSA conference be without its special events? The President’s Reception gave the President and Board of Directors the opportunity to meet and greet new and returning conference attendees. An outing to Nauticus, a maritime museum, was captivating. We boarded the cruise ship “USS ERICSA” and dined and danced the evening away at the Captain’s Ball. The conference culminated with ERICSA’s Child Support Jeopardy Championship, with Vernon Drew winning the battle of the ERICSA Presidents. Thank you for joining us in Norfolk, VA, and we look forward to seeing you in Memphis, TN in April 2008. ERICSA would like to thank all of our corporate exhibitors and sponsors for their support in Norfolk, Virginia. If you are interested in exhibiting or sponsoring at our 2008 conference at The Peabody Hotel, Memphis, Tennessee, please contact Jim Dingeldine at jim.dingeldine@dss.sc.gov.